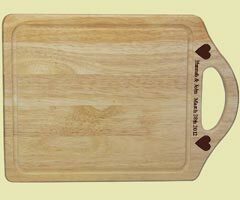 A great bread or chopping board for the smaller kitchen as it can be hung on the wall when not in use. A great bread or chopping board for the smaller kitchen as it can be hung on the wall when not in use. Why not add a personal message or image either to the handle or the face of the board.